Cursive writing is an important part of our home learning studies. When the girls showed interest in learning to write their names in cursive, I made it a point to teach them. 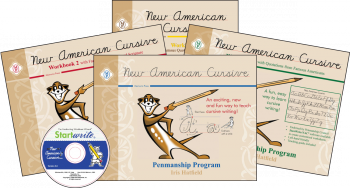 Learning cursive has not been the easiest for our youngest daughter so when I was presented with the opportunity to review Memoria Press’ New American Cursive: Penmanship Program Workbook 1, I asked my daughter if she wanted to give it a shot. She happily agreed. Memoria Press sent her a new copy of the New American Cursive: Penmanship Program Workbook 1. The teaching guide for the program is included within the student text. She was thrilled to receive her new book and jumped right into it on day one. Each letter is presented on a page alone called the instruction. The letters are large enough to trace with your index finger which allows the student to feel the letter before writing it. The instruction page also reminds the student of the proper way to hold the pencil for both, right and left hand students. There’s a cute little meerkat named Mr. Meerkat that guides the student through the book offering reminders and highlighting directions. Each letter follows the same routine so there is very little confusion. The practice pages focuses on one letter, and the student traces the letter several times. After tracing the letters, the student is to write each letter twice followed by circling the letter that was written the best. The pages are not daunting. I like this. There is just enough practice on each page without overkill. This makes it more relaxing for her because the page is not covered from top to bottom with repetition. This also makes it a part of our homeschooling curriculum that she looks forward to since the lessons are not time consuming. She completes one page each day. Her favorite part of theNew American Cursive: Penmanship Program Workbook 1 was the Fun Exercises & Artwork pages. These pages offer two lines of cursive practice including tracing and writing the letters and a large area for drawing at the bottom of the page. In many cases tearing out the handwriting pages works best for getting a good form. I have never been one to tear pages out of a book because it means that I would have to find somewhere to store the torn out pages after completion. Memoria Press has this problem solved. The handwriting book is in spiral bound which makes it easier to go from page to page. Another nice thing about the book being spiraled bound is that my daughter did not have to worry about the pages flipping or moving while she was working on her cursive writing. Memoria Press' New American Cursive: Penmanship Program Workbook 1 worked well for my daughter. It encouraged her to start back practicing her cursive writing. She feels more confident writing in cursive. The only letters that were not formed in the traditional way were the uppercase letters F, Q, and Z. There were other letters that did not have as many loops which made forming the letters less tedious for her. I know that this impacted her feelings of success with the program. She is looking forward to completing the cursive program. I am sure as she continues through this program her cursive skills will only get better.